From the very beginning, the film displays almost overwhelming nuance in its presentation of a complex post-apocalyptic world. Picking up 10 years after Rise, which ended with the outbreak of a fast-spreading human-killing virus, mankind is nearly extinct, and it has been years since Caesar and his people last encountered humanity. Living on their own in the woods outside San Francisco, the apes have carved out a happy, peaceful existence for themselves, and it is remarkable just how fast we come to care for this community, how immediately the literal and emotional realities of their existence seems palpable. And yet, when the humans do arrive in the apes’ territory, setting in motion the action of the film and threatening the apes with their presence, we do not instantly shun them, as we would in so many other, similar stories. In sharp and economic fashion, Reeves demonstrates how much mankind has suffered, what toll has been exerted on the survivors – primarily represented here by Jason Clarke, Keri Russell, Kodi Smit-McPhee, and Gary Oldman – and, most importantly, where the violent instincts of the worst of the survivors comes from. From the moment man and ape come into conflict, nobody’s point of view, on either side of the equation, is treated as anything less than valid, each and every character, no matter how minor, taken seriously so that the nature of their stance is made clear and understandable. 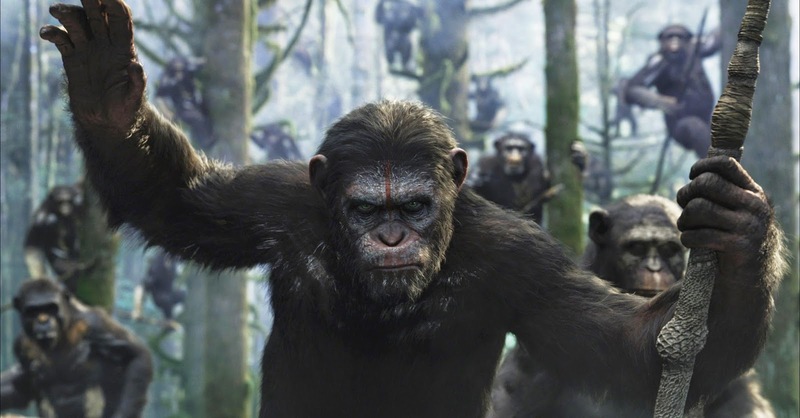 The film resists any overt blockbuster spectacle for a very long time, preferring instead to follow Caesar, his bitter second-in-command Koba (one of the apes abused horribly by human scientists in the first film), and human leader Malcolm and his family as they all try to understand the situation and whether or not trust can be achieved. It is in those quiet moments of push-and-pull between the various fears, desires, and apprehensions of all the major players, human and ape alike, that the film feels so alive and unique, so smart, thoughtful, and emotionally committed to seriously illustrating what could so easily be – and has often been, in between the original Planet of the Apes and 2011’s Rise – an absurd premise. While Dawn of the Planet of the Apes grants its human characters several magnitudes more nuance and shading than what was offered in its predecessor, it still, like Rise, tells the story primarily from the ape perspective. It continues to be a wildly effective direction for the series, one that grants the film a tone, style, and rhythm unlike anything else in mainstream cinema, and what I found most surprising here is how this winds up being the story of how Caesar learns to accept that violent, hateful instincts exist across species lines – that drawing divisions between ‘us’ and ‘them’ is easy in theory, but absolutely untenable in practice if he wants to effectively lead and protect his people. 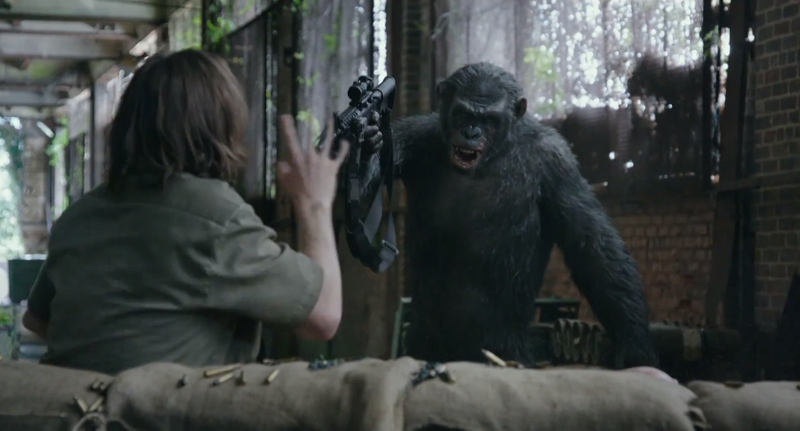 The film is ultimately about how universal the instinct for violence is, how easily and automatically we can all turn to it in moments of fear, desperation, or intense emotional duress, and for the most part, the movie avoids making judgments, preferring instead to analyze why people (or apes) choose paths of destruction, and how that ethical corrosion is hard to expunge from communities once introduced. Conflict is presented as an inevitable force here, with life always finding a way to destroy itself and others no matter how many opportunities exist for peace. The film slowly, quietly instills a sensation of dread and helplessness in the viewer, for as we see each perspective and all points of view clearly and emotionally illustrated, every side of the conflict and each potential powder keg analyzed with lucidity and reason, the inevitability of a violent eruption becomes more and more horrifying. Where most Hollywood films, especially those released as major summer tent-poles, anticipate the outbreak of ‘action’ with mounting excitement and enthusiasm, Dawn of the Planet of the Apes dares one to wish for an absence of incident, makes one sickeningly afraid of the oncoming spectacle, and in so doing, says something profound – pessimistic, but meaningfully so – about how utterly life is ruled by its basest, most brutal instincts. And while that would certainly be enough intellectual meat to fill several science-fiction films, it is in its specific presentation of guns as a weapon of escalation that Dawn feels very much of the moment, incredibly potent for 2014 America. Before seeing the film, it’s easy to look at all the posters and promotional images featuring apes wielding firearms and find them amusingly ludicrous, but in context, it’s an essential image the film takes utterly seriously. Every major turning point of the plot is built around a gun either going off or being discovered, the story elegantly and powerfully refuting the notion that guns are only bad in the hands of bad people. Here, as in the real world, a gun can make anyone, no matter their intentions, a monster, both because of what such a weapon is capable of – spears, bows, and knives, do not have the same capacity for overwhelming, violent dominance – and because of the intent to inflict lethal harm a gun connotes. If the humans never entered the apes’ territory with guns, and if the apes never turned those guns back on the humans in mirror imitation, the conflict would not immediately dissipate, but it would take on such a very different shape. The film’s suggestion that guns, of all the technologies which might survive a near-apocalypse, would be the objects humans cling to hardest is provocative and disturbing, and makes the action of the film feel more immediate, raw, and painfully real than it already is. When Koba, whose deep-seated distrust of humans is brought back to the surface by their propensity for firearms, picks up a rifle for the first time, it feels truly horrifying, because he has now symbolically chained himself to the worst of humanity, and everything the gun represents corrupts him and his community from the ground up. For a long time, Dawn of the Planet of the Apes excels almost entirely on the strength of details like these, its intelligence and intent baked naturalistically into the way it presents all its characters as part of a larger world. For instance, I absolutely love watching how Caesar navigates his surroundings as leader, and how much one senses the weight of the world on his shoulders in every interaction he has, be it with ape or with human. Even when sharing time with his family, there is tremendous sense of weariness and responsibility to what he does, because he knows that if he fails even in the slightest as a leader to his people, his family will pay the price. Each of his decisions is mirrored or contrasted by the actions of other characters, like Koba, constantly struggling to reconcile his loyalty to Caesar with his rage towards humans, or Malcolm, just trying to find a way for humanity to get what it needs without igniting conflict. As Dreyfus, leader of the human survivors in San Francisco, Gary Oldman has some of the best moments in the entire film, small but crucial digressions in which we are made to empathize with a figure who could so easily be the ‘villain’ in a simpler, duller version of this story. But because we come to care about and see eye-to-eye with him, and with Malcolm, and Koba, and Caesar, and every other character of note, one’s stomach has been worked tightly into knots by the time violence erupts. We are so worried for the sakes of all involved, so hoping they can find a way to defuse the situation and avoid encountering any more pain or suffering, that there is nothing even vaguely ‘thrilling’ about the action beats. They are just horrifying, sad, and heart wrenching, every death on both sides of the battle feeling painfully unnecessary. From start to finish, Reeves stages things in a very immediate, emotional, and highly sensory way, and that comes to the forefront in the major mid-film battle, which is impressive in how far it pushes things, how ugly and painful it makes the combat, how tight it twists in the knives. The film does, unfortunately, fall off for me a fair bit in the third act, once the conflict has stabilized and one of the major characters has been clearly installed as the antagonist of the piece. The film is at its strongest when positing that there is no such thing as an antagonist, just many individual figures, all incapable of truly understanding where others are coming from, trying their best to do the right thing and inevitably coming up short. It is the tapestry that matters here, the idea that there are no easy solutions or straight paths when violent conflict becomes a possibility, but the third act, while beautifully staged, is too conventionally organized for that idea to ever truly land home. The goal becomes too clear for Caesar and Malcolm, the way to stop the bleeding too direct, and the film loses something once the conflict becomes simplistically embodied by one particular character who must be stopped. There are two major set-pieces to the film – the aforementioned second-act battle and the third-act climax – and while each is just as technically sound as the other, Reeves realizing both with visual ingenuity and immense aesthetic weight, the difference in emotional effectiveness between the two is vast. The earlier sequence is a powerhouse because it leaves one with no idea what to root for other than an immediate cessation of all violence, the only possible outcome being tragic for all involved, while the climax is relatively easy to swallow, the goal of the action obvious and inarguable. Where I had previously felt physically nauseous from the intensity of the proceedings, the climax left me feeling mostly cold, and while the film’s closing scene is a major step back in the right direction – the thematic note the film chooses to end on is appropriately defeatist and immensely thought-provoking – so much of the third act feels so simple and cursory as to inevitably rob the film of some weight. Nevertheless, this is only judging the movie against the impossibly high bar it sets for itself, and it must be reinforced what an absolutely remarkable achievement Dawn of the Planet of the Apes is as a whole. So much of what the film does well feels effortless and invisible, from the small details of the narrative and characters, to the absolutely pitch-perfect pace of the storytelling, to the quietly affecting beauty of Michael Giaachino’s score, to the visual poetry with which cinematographer Michael Seresin shapes each and every frame. Above all else, the apes themselves feel so much like living, breathing, three-dimensional characters that it is easy to forget there is an army of immensely talented performers and visual effects artists behind them, all doing their job so well that we forget they are there at all (where Andy Serkis was the driving force of the first film, he has, without giving any less of a great performance, become first among equals here). 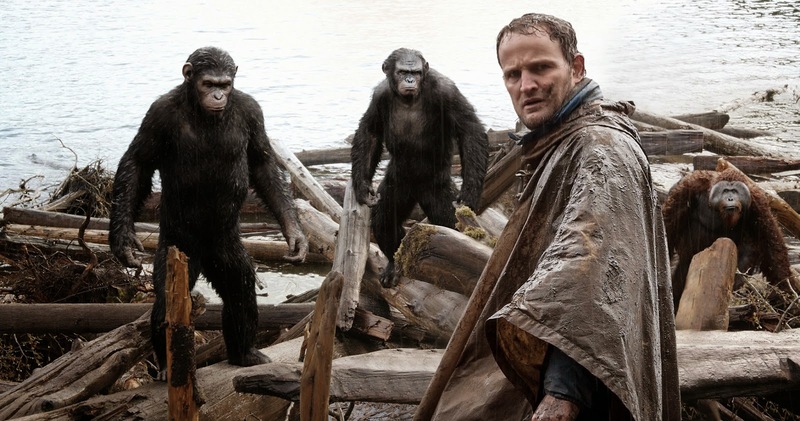 When Rise of the Planet of the Apes came out in 2011, I thought its evocation of Caesar was perhaps the single most impressive visual effects feat in cinema history, and now, Dawn has rather forcefully supplanted it. The fact that every single one of the dozens and dozens of Apes in the film looks utterly and completely photorealistic, every bit as much a part of the physical world as the human characters, is one thing; that every one of these creatures is also imbued with a real, tangible performance, made possible by motion capture technology so rich and seamless it feels like magic, is another matter entirely. Dawn of the Planet of the Apes is proof that films can achieve more or less anything now, can bring anything to life in whatever quantity one desires, and can even be done with effectively limitless amounts of soul. This is a film that could not be possible without its mind-boggling effects, and the effects, in turn, would not be possible without this terrific, spirited story to inspire their creation. 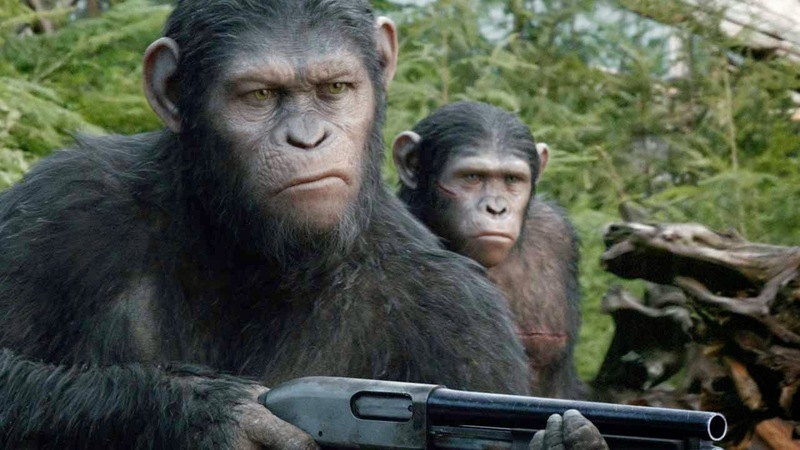 In that way, and in the many dark, contemplative, and harrowing ways it challenges our traditional notions of what constitutes a Hollywood summer blockbuster, Dawn of the Planet of the Apes feels, at least in part, like a true subversion of the mainstream, a major release that has all the aesthetic marvel and big-budget spectacle of a conventional hit, but demands something very different from its audience. That the film doesn’t quite bring it all together in the end hardly seems to matter – Reeves and company have swung for the fences, and the effort is equal parts devastating and awe-inspiring.